Exchange Export Tool allows to Export Exchange 2016 mailbox to PST format. The entire mailbox data like emails, contacts, calendars, etc. is exported to Outlook PST file without any change in its metadata & formatting. Exchange Export mailbox to PST Tool facilitates the users to convert Exchange EDB Database to PST file format. A user can check the required Exchange mailboxes and can then export them along with their entire data items from Emails, Contacts, and Calendar etc. Export Exchange offers the option of selective emails filter that allows users to Export Exchange Mailbox to PST. This will help users to Export or move selected categories like Mail, Calendar, Contact, Notes in the specified range of date. Export emails from Exchange to PST file, Active Directory Server plays a important role as it automatically scanned and loaded the Active Directory after clicked on Export tab. All Exchange Server and Active Directory will be visible. Live Exchange Server environment is necessary to perform the export process. However, it is possible to Export Exchange 2007 database to PST without Outlook. Once the entire mailbox data is exported to PST, the user needs to have MS Outlook in order to access PST file. Once the Exchange Export Software successfully export Exchange Database to PST file format, a progress report is generated in CSV File format. This report illustrates details like name of mailbox, number of emails Exported, etc. Download Exchange Export Software demo version to study the working of Export Exchange mailbox to PST. The demo or free version of the software Export only 25 items per folder from selected files Exchange Mailbox. Make sure MS Outlook should be installed. Check if you have login as administrator on your machine. Is Live Exchange Server environment necessary for Export mailbox from Exchange to PST? Yes, it is mandatory to have Live Exchange Server environment in order to migrate Exchange mailbox to PST files. Can the Exchage Export Software extract multiple mailboxes to Outlook PST format? Yes, the Export Exchange 2010 database to PST software gives the facility to Export multiple Exchange mailboxes to PST format. Is there any size limitation moving large size Exchange database to PST File format? No, there is no kind of size limitation imposed on the Exchange mailboxes, which have to be exported to PST file. What does export report consist of? The export report generated at the end of the export process gives a detailed description of the name of the mailbox, number of emails, contacts, calendars, etc. that have been exported. Recently I disabled some mailboxes, now I want to export them to PST. Can I perform conversion using Exchange Export Tool? No,the Export Exchange 2007 Mailbox to PST Tool cannot export disable mailboxes, as it work on Live Exchange Mailboxes. Does Exchange Export tool support Exchange Server 2016? 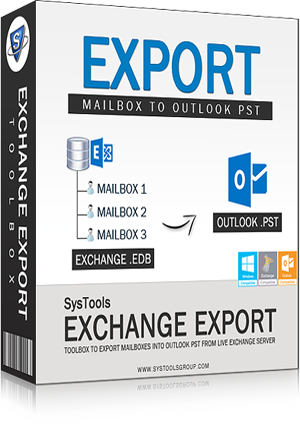 Yes, the Export Exchange mailbox to PST software is compatible with all versions of Exchange. It extract mailbox from Exchange EDB File 2010, 2013, 2007, 2003, 2016. "We are really glad that we opted for Exchange Export in order to export Exchange 2010 mailbox to PST. Thanks a lot." "At first I was unsure of Export Exchange 2003 database to PST file with the help of this tool. However, as soon I used the demo version, it didn't take long to purchase its license version. It's really a great tool." "Working with Exchange Export has been a fabulous and hassle-free experience. The tool facilitates us to export several Exchange mailboxes at once to PST format. Good work guys." "This tool turned out to be the best tool for me as it successfully export Exchange 2013 mailbox to PST without any data loss. It's worth using this application. Thanks Team!"